Remember my previous post regarding these Chloe beauties? The ones that I can't take my eyes off and made me drool all over my keyboards? They're pretty, edgy and equipped with a VERY wearable heel. YES!!! 2 inches high and none of those ridiculously skinny stilts that will snap my ankles in two. The only problem is...... the price tag of £660 made me feel rather light headed. Sure, these far more affordable alternatives from Zara aren't made of leather but heck, I'm not going to complain when they're only £39.99. The courier driver actually delivered them on Sunday. I love my Hermes courier guy. They make my short stumps legs.....look looooong. They're striking enough to look rather eye catching but not overly so, if you get my drift. Now all I have to do is wait for spring to finally arrive. Whoop whoop! A result! I've not had a courier delivery for a while - I must be poorly. REALLY??!!! Look at it this way, you've been really good :P I really need to try out your sweatshirt idea. Do you think the iron on font will work on merino wool? Mel, do you have the link to these wedge gladiators? I've gone through their shoes collection online but can't seem to find them. Found them! Mwah, mwah, mwah, mwah. Ok, that probably grossed you out but what the heck, you deserve a few kisses for helping me save some moolah. Great pick! I may even like the ones from Zara more than the ones from Chloe. That is just wayyy too much to spend on a pair of sandals. I hope Spring will come soon, so you can take them out. 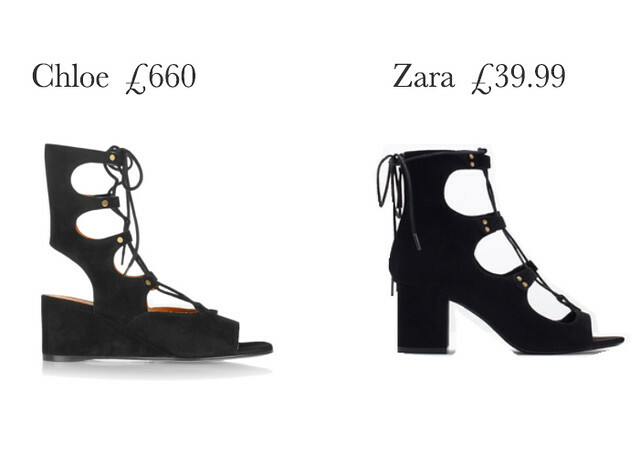 I really don't get why the designers are pricing the shoes way beyond reach these days. In fact, the prices seem to get higher and higher each year. somehow i prefer zara's . They look better and i am sure make the foot look better ! Was in the UK last week and went for a browse at the House of Fraser. As one does. It had a huge label saying due to the delicate nature of the fabric, treat with care blablabla So I'm feeling up the material thinking oh is it silk and it feels kinda odd underneath the fingers. Check the label - 100% polyester. !!! The best bit? The price. Sixtyfreakingfive pounds! For 100% polyester! (facepalm) You can get a decent looking viscose blouse in Primark for crying out loud. Sometimes I think the retailers are getting away with stuff/prices like these because they can. Yeah, what's up with crazy pricing these days?!!! I've seen plenty of polyester crap for £100 and upwards. I mean....yes, I don't want child labor etc but charging an arm and a leg for crappy fabric and sub par workmanship is just WRONG. Great minds think alike! Same here....waiting for the weather to warm up a bit. It's still too cold here.